J.J. Panzer’s business maximizing pass-throughs landlords can pass on to tenants became an issue in his brief tenure on the rent board. 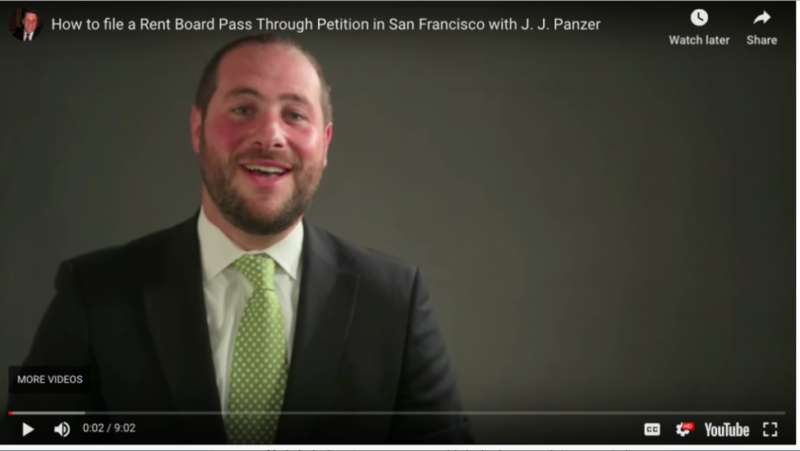 J.J. Panzer, a Mission landlord and property manager serving as a mayoral appointee to the rent board, withdrew from that body today, prior to what promised to be a contentious confirmation hearing before the Board of Supervisors. Panzer on Nov. 28 was grilled by a Board of Supervisors committee about his eligibility issues for one of the designated landlord seats on the rent board. At issue was a component of Panzer’s business, the Real Mangement Company. Among other services, it specializes in maximizing the pass-throughs landlords can charge tenants for work on their properties. Panzer is, in part, contracted by landlord clients to garner rent increases, which is highly germane to what the rent board regulates. Deputy City Attorney John Givner at that time said he would have to look into whether Panzer could serve on the rent board without being subject to immediate and ongoing Ethics Commission fines. Panzer says he today received a call from the office of Mayor London Breed, which in October appointed him to the rent board. “They said it would be a disaster for them if I didn’t make one of those two choices,” he says. “The progressive faction of the board would make it a very ugly thing … it turned out to be a political minefield.” So he withdrew. Panzer, Mission Local readers may recall, is the Mission landlord and property manager who earned a degree of infamy in 2015 when he stuck popular brunch spot Boogaloo’s with a rent increase from $4,200 to a parodic $17,500. Panzer, however, subsequently flipped the standard Mission tale of greed and displacement by apologizing to Boogaloo’s management, lowering the rent to a reasonable $7,500, and working to get the restaurant back open. In other words, he helped make things right. He couldn’t make this appointment right, however. And, from the start, it appeared to be a rushed and less-than-thoroughly organized affair. The letter nominating Panzer to the rent board is dated Oct. 29, but he wasn’t sworn in until Nov. 13 — and was serving as a rent board commissioner only an hour later. This came as a surprise to his predecessor, Cal Abe, who hadn’t been informed his tenure on the board had run its course. He was seated in Panzer’s chair when Panzer arrived. Along similar lines, the conflict of interest that ultimately cost Panzer this job was not bird-dogged by the mayor’s office ahead of time — and, under questioning by Supervisor Norman Yee in November, Panzer clearly had no idea these rules existed. Eight supervisors would have had to vote against Panzer today in order to remove him from the rent board. Panzer thinks he had the votes “but it would have been ugly.” It certainly would have, as approving him would have required a supervisor to greenlight a commissioner deemed incompatible under the city’s own ethics rules. As it is, Panzer got out before he incurred any damage — or created any for the mayor who appointed him. “It could’ve been a black eye for me,” he said. Panzer anticipates a busy 2019. But not in public service. It is a shame that a good person like JJ Panzer was forced off the Rent Board. He is actually a progressive thinker, and cares about affordable housing in the City. The Board needs more balance, objectivity, and neutrality. Right now it is very heavily biased in favor of renters. Any tenuous claim that comes before the Board by renters is granted. In part they are handicapped by bad and biased City regulations. There are a few basic reforms needed to rent control in SF. For one, there needs to be means testing, because many people getting the subsidies required by rent control actually make enough money to be able to afford something closer to a market rate rent. Second, the practice of one tenant handing off a unit to another person has to stop. Tenancy should be for the one individual whose name is on the lease only.